Shortly after claiming no official timetable, Bethesda has released Dawnguard on PC. PC and PS3 gamers looking forward to Dawnguard, Skyrim's first expansion, got some bad news late last week. Although Dawnguard had already been released exclusively on the Xbox 360 and had stayed there for 30 days as a 'timed exclusive,' the DLC was nowhere to be found on other platforms. Bethesda Marketing Executive Pete Hines then shot down any hopes of a quick multiplatform release, saying that there was no announcement planned for the expansion's release on PC or PS3. But in a sudden turnabout, Bethesda has not only confirmed that Dawnguard is landing on the PS3 and PC, but that it's actually already available on the latter. The surprise announcement came during QuakeCon 2012, less than a week after Hines' discouraging statement over Twitter. Bethesda didn't mention why Hines played down the possibility of Dawnguard's multiplatform release so close to the official announcement. Bethesda may have not nailed down the exact release dates at the time of Hines' tweet, or it may have just wanted to keep things under wraps to surprise QuakeCon attendees. Either way, the news was good for PC gamers, who can get the DLC from Steam right now for $19.99, but bad for PS3 owners, who will have to wait longer. 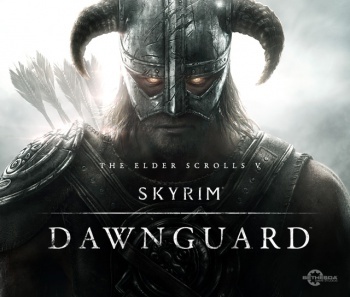 Bethesda explained the PS3 version's delay in its blog, stating that the company is "not satisfied yet with Dawnguard's performance on the PS3." It's understandable that Bethesda would take extra precautions for this expansion, considering that the PS3 version of Skyrim was notoriously laggy compared to the PC and Xbox 360 versions. Bethesda did not give an indication of when the expansion will make it to the PS3.